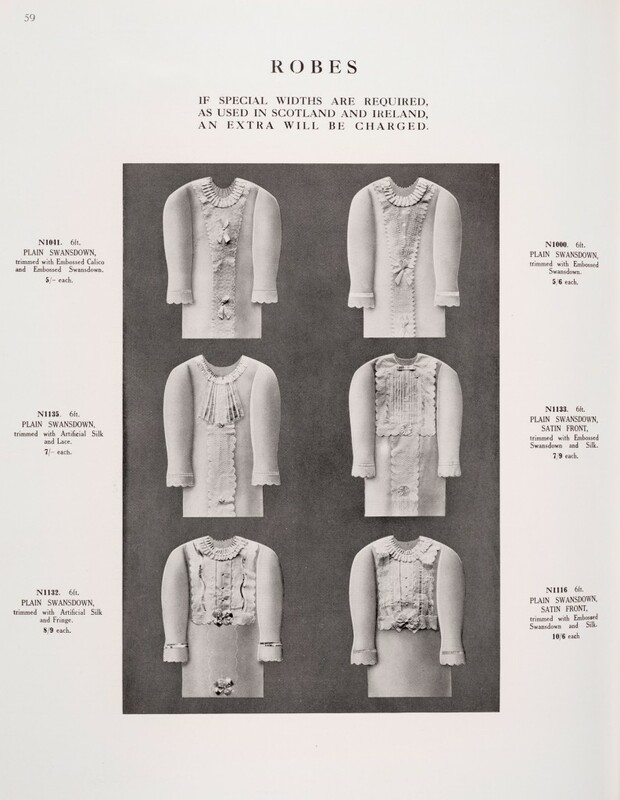 Although colloquially referred to as ‘Shrouds’, Newman Brothers’ trade catalogues list these funerary garments as robes. They were part of the coffin furniture product line on offer at the company and also included ‘frillings,’ side sheets and pillows to dress the inside of coffins. 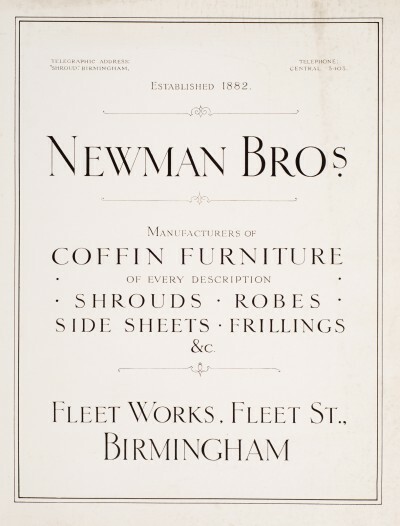 Newman Brothers do not seem to have supplied any textile-based goods in their early days in business, and it appears that this was a sideline they developed as they became more confident with the market they were supplying and no doubt too, as their clients showed an interest in purchasing them. It made perfect business sense to supply goods for the inside as well as outside of coffins. 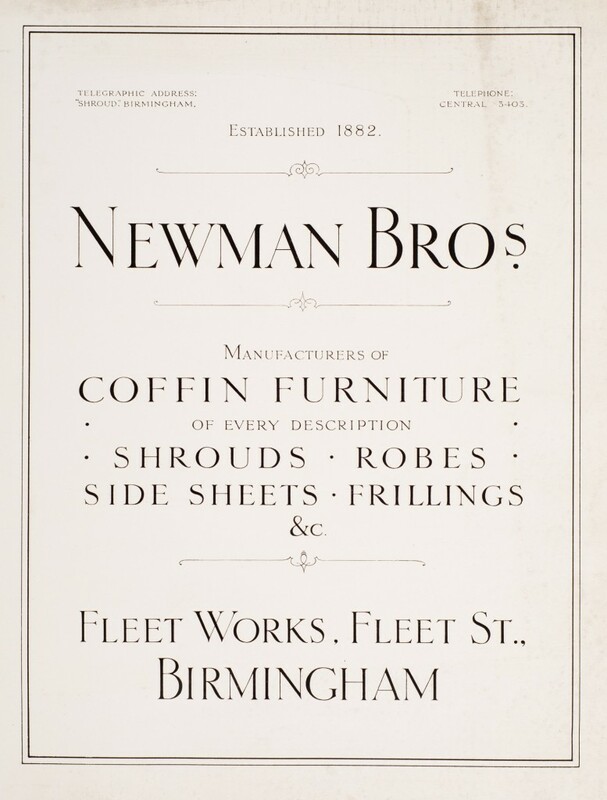 We cannot date the trade catalogues precisely as they do not include publication dates, but we do know that Newman Brothers were advertising for ‘girls to work in the shroud trade’ as early as 1914. They may have been making them before this date too, but currently our evidence does not predate 1914. The catalogue above, illustrates what we believe is their 1920s’ product range and shows the prices of robes on offer ranging from plain-embossed calico at 5 shillings each, to embossed satin Swansdown with silk braids at 18 shillings each. During this period they offered around ten robes of varying finishes for adults and didn’t distinguish between male and female products. Interestingly, the only gender distinction they made was regarding the registered and more expensive lace that would adorn the robes. Even here, it wasn’t a colour distinction, but rather one based on design.